When Cruise International wanted a totally sophisticated image for their new Norfolk dinner/excursion boat, their president, Richard O'Leary, envi- sioned a sleek mega-yacht concept from the Italian school of yacht de- sign. 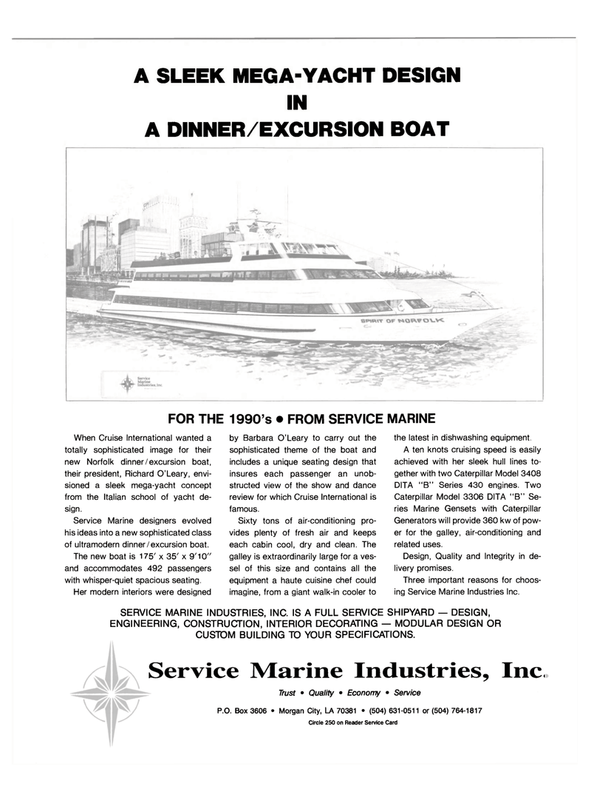 Service Marine designers evolved his ideas into a new sophisticated class of ultramodern dinner/excursion boat. The new boat is 175' x 35' x 9'10" and accommodates 492 passengers with whisper-quiet spacious seating. Her modern interiors were designed by Barbara O'Leary to carry out the sophisticated theme of the boat and includes a unique seating design that insures each passenger an unob- structed view of the show and dance review for which Cruise International is famous. Sixty tons of air-conditioning pro- vides plenty of fresh air and keeps each cabin cool, dry and clean. The galley is extraordinarily large for a ves- sel of this size and contains all the equipment a haute cuisine chef could imagine, from a giant walk-in cooler to the latest in dishwashing equipment. Generators will provide 360 kw of pow- er for the galley, air-conditioning and related uses. Design, Quality and Integrity in de- livery promises. Three important reasons for choos- ing Service Marine Industries Inc. CUSTOM BUILDING TO YOUR SPECIFICATIONS.